Tonight's beer of choice is another EPIC one! *pause for laughs*.... Seriously though, EPIC Hop Zombie is back! And if last years is anything to go by it's a stunning Imperial IPA! It's only just come back in the country and came to me via Perth so I can't wait to get into it! Considering how many beers from EPIC I drink it seems strange to me that this is only the second one I've fully reviewed. I felt sure that I reviewed the Epicurean beer from last year, but clearly not so I will endeavour to dig out one of the bottles I kept for ageing and review it soon. Anyway back to the Hop Zombie, it's time to drink it! Hop Zombie is the clearest IPA you are ever going to see, if poured into a normal beer glass you could easily mistake it for a lager. There's plenty of carbonation rising to a somewhat disappointing head. The head is made up mostly of large bubbles and fades to a small ring quite quickly. What head there is leaves mild lacing but it's nothing to write home about. It really is a unique look for an IPA. The nose of this IPA is packed full of fruit flavours from the hops. I'm getting quite distinct flavours of apple, mango, passionfruit, paw paw (I think) and then just generic citrus, which is hugely powerful. I can't detect any sweet malts but this beer isn't about that. It's all about the hops and they smell incredible; tropical, fruity and bitter. They are clearly Sauvin (or I sincerely hope they are! ), if they taste is anything like the nose this will be a brilliant IPA. 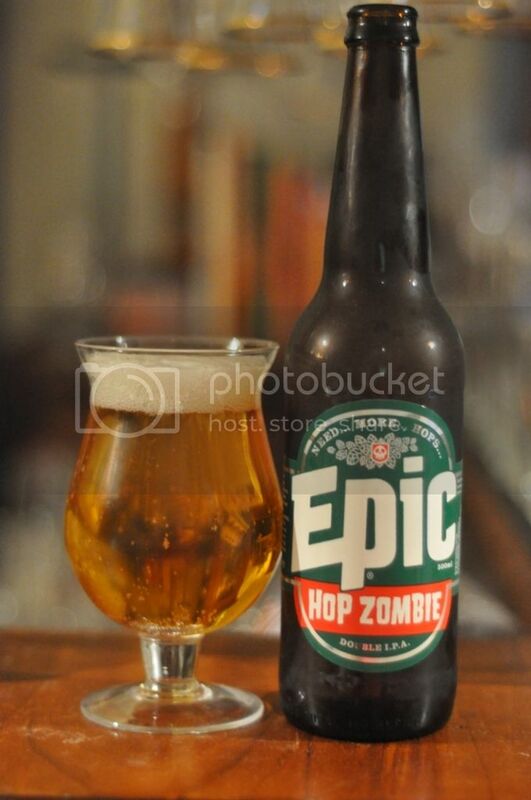 EPIC's Hop Zombie is a balanced hop bomb, with no malt! That would seem to be an oxymoronic comment but that is really how the beer seems to me. All the tropical and citrussy hops from the nose are present on the palate. It is one of the most complex IPA's on the market, however the words to describe it are proving hard to come by tonight, so you might need to buy it for yourselves to experience all the intricacies. For a beer that is totally one-sided (malt vs. hops) this has to be the best, it's simply brilliant! Trust me you won't regret buying it! I've only ever spoken to one so-called IPA drinker who has said they dislike this beer. It's that good that I don't believe I'll ever find another one. I drink alot of IPA's from all around the world and besides some of the amazing Mikkeller ones I have had New Zealand IPA's are right at the top of my list. EPIC's Hop Zombie is top of that list! If that isn't a glowing enough review for you I don't know what is! If you see this beer buy it, if for no other reason than to sell it to me for a profit.